The Hippoboscidae are commonly called louse flies or ked flies. The bat flies are Nycteribiidae and Streblidae; the latter are probably not monophyletic. The family Glossinidae, monotypic as to genus, contains the tsetse flies, economically important as the vectors of trypanosomiasis. The enigmatic Mormotomyiidae are entirely monotypic at present, with the single species Mormotomyia hirsuta known from one locality in Kenya. Most probably, the Mormotomyiidae belong to the Ephydroidea and not to Hippoboscoidea as previously constructed. In older literature, this group is often referred to as the Pupipara ("pupa-bearers"), because, unlike virtually all other insects, most of the larval development takes place inside the mother's body, and pupation occurs almost immediately after "birth" – in essence, instead of laying eggs, a female lays full-sized pupae one at a time. In the strict sense, the Pupipara only encompass the Hippoboscidae, Nycteribiidae, and "Streblidae", which in older works were all included in the Hippoboscidae. Species of the Hippoboscoidea do not lay eggs. Instead, the larvae hatch in utero, are fed internally by 'milk glands', and pass through three morphological stages before being deposited to pupate. This type of reproduction is termed as Adenotrophic viviparity. ↑ Kirk-Spriggs, A.H., Kotrba, M. & Copeland, R.S. 2011. Further details of the morphology of the enigmatic African fly Mormotomyia hirsuta Austen (Diptera: Mormotomyiidae). African Invertebrates 52 (1): 145-165. 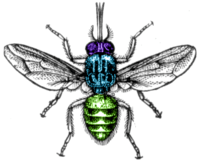 ↑ Krafsur, E. S. "Tsetse flies: genetics, evolution, and role as vectors." Infection, Genetics and Evolution 9.1 (2009): 124-141. Wikimedia Commons has media related to Hippoboscoidea.